How fortunate we are to live at a time and in a place where we are exposed to just about all the glorious gastronomic delights of the world. When I was growing up, Italian and Chinese restaurants were considered exotic but oh how things have changed... and for the better! Within a few blocks in any direction from our home, we have a choice of myriad ethnic cuisines and while I still count Italian and Chinese as favorites, along with Thai, Indian and all Mediterranean style cooking traditions, top of the list currently goes to Japan for its delectable raw fish sushi and sashimi which I can’t seem to get enough of. So imagine how delighted I was when we were invited by the Balfegó Group - a premier producer of quality tuna - to attend a Kaitai Show; a spectacular exhibition of the butchering of a 550 pound Bluefin Tuna removed from the sea less than 24 hours prior to appearing on the table at La Nacional in New York City. A Kaitai demonstration is usually only attended by the cognoscente; i.e. 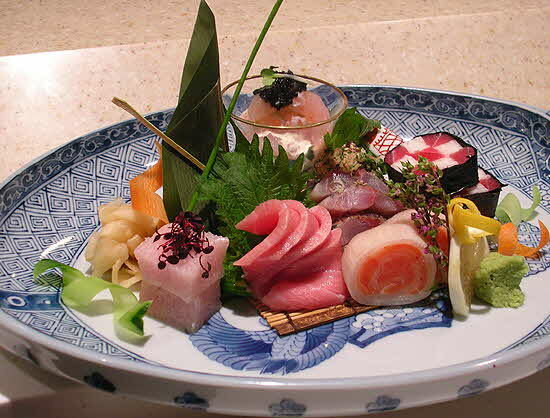 Japanese chefs and restaurateurs or wholesale brokers of superior quality seafood. An entire fish is apportioned and every part of the tuna is made use of, not only the loins and belly for sushi/sashimi but other parts as well such as steaks and cutlets for grilling, cooking or salt-curing. This being our first Kaitai we were unsure if we would get the chance to taste the results of the efforts of master tuna cutter, Nobuyuki Tajiri. Thankfully the gods of gluttony smiled upon us and we managed to ingest a goodly amount of the freshest, most succulent, well designed rolls and sushi pieces, thanks to the talented chefs from ZUMA, a contemporary Japanese cuisine restaurant who took charge of the kitchen once the demonstration part of the program was over. 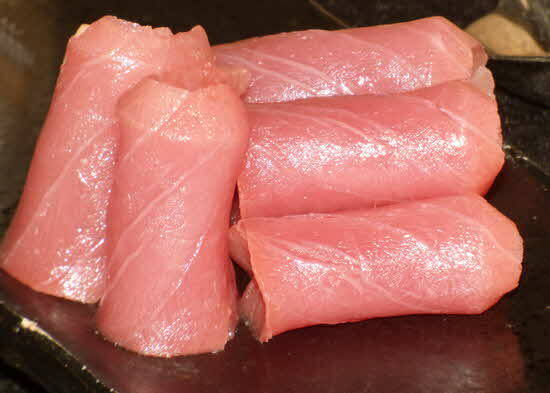 There are many varieties of tuna but bluefin and yellowtail are considered the premiere ones, used for sushi/sashimi in top-of-the-line restaurants in Japan, the United States and most of Western Europe. Bluefin is a large fish that, when caught, can weigh as much as 450 to 750 lb. depending on their age. Balfegó, is a family owned Spanish company, that has for 5 generations - a period of over 100 years - operated out of a small fishing village south of Barcelona. Over the years they have perfected a farming method that provides fresh, healthy product to the market servicing the ever growing demand for quality fish, farmed in a humane and sustainable manner. 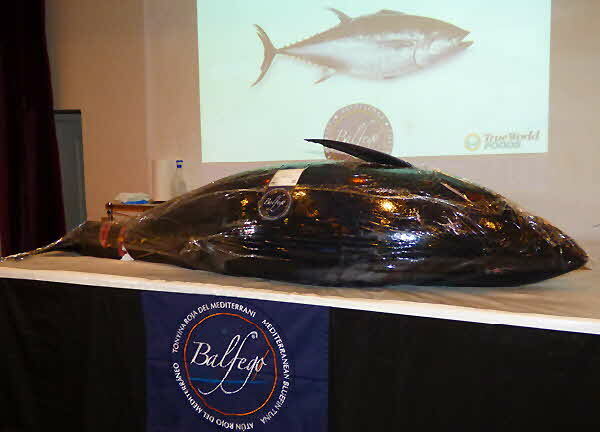 Bluefin is caught by the Balfegó fishing boats when the tuna returns from its spawning grounds in the areas mostly around the Balearic Islands and the Western Mediterranean. Tuna stop feeding on the way to spawn, losing much of their adult weight in the process, making it easier to capture the large fish after spawning. Tuna lay around 20 million eggs on the surface of the water of which barely one out of a million survive. Fish are targeted for capture after they reach 100 lbs and are around 14 years old. After being captured, the tuna are placed in very large pens, about a football field long giving them ample swimming space, and fed 100% wild caught fatty fish such as herring, sardines and mackerel, all of which are natural tuna prey, until they regain their weight. This process provides year-round sustainable production with no tuna kept longer than a year or harvested before it reaches 500 lbs. or more. 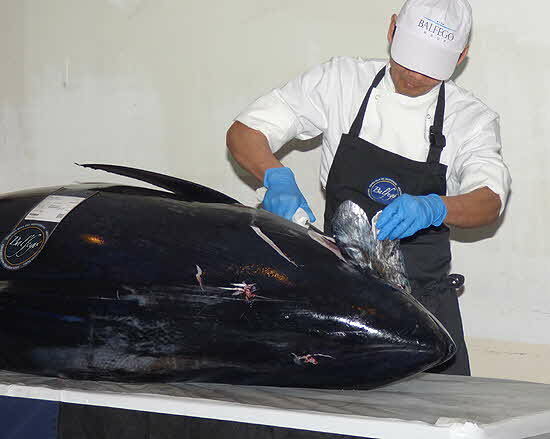 To insure the highest quality, tuna are harvested only when an order is received from a wholesaler or broker and guaranteed with a health certificate so the final user is assured of the quality and freshness of the end product. Actually, each fish is given a unique code number and a QR code to provide details and traceability; you can input this code at Balfegó’s website or scan the QR code on a smart phone and all the necessary details become available. Tuna fishing is regulated by law on a worldwide base and limited to a 4 million ton annual catch only after spawning, to guarantee a continuing population of which the U.S. is the end user of about 1,000 tons per year. But the market is growing as more and more Americans discover the delights of this tasty and healthy product of the sea. Or for those who simply choose to enjoy a meal without knowledge of where it came from, visit your favorite Japanese restaurant and ask who their bluefin tuna supplier is, and if its Balfegó you can eat to your heart’s content knowing that you are eating the finest.